A champion between-the-wars player who excelled as a coach after WWII, Gavin Luttrell was instrumental in leading North Launceston into arguably the most successful era in the club’s history. Born in 1912, Gavin Luttrell began his senior playing career with the Bellerive Football Club, and was a member of the club’s back-to-back premiership teams in 1930-31. The following season, Luttrell made the switch to TFL football when he joined Lefroy, and over the following seasons he elevated himself into the top echelon of players in southern football. A rover/wingman of great prowess, Luttrell – along with established stars such as Eric Zschech and Len Pye – was widely viewed as one of the club’s finest players, a view seemingly confirmed by Luttrell winning four consecutive Lefroy club champion awards from 1937-40; the first of these came in the club’s final premiership year of 1937, a triumph in which Luttrell played a key role. He was also regarded by many contemporaries as one of the finest players in his position in the state, regularly appearing for TANFL representative teams, though curiously he was never chosen to represent Tasmania. 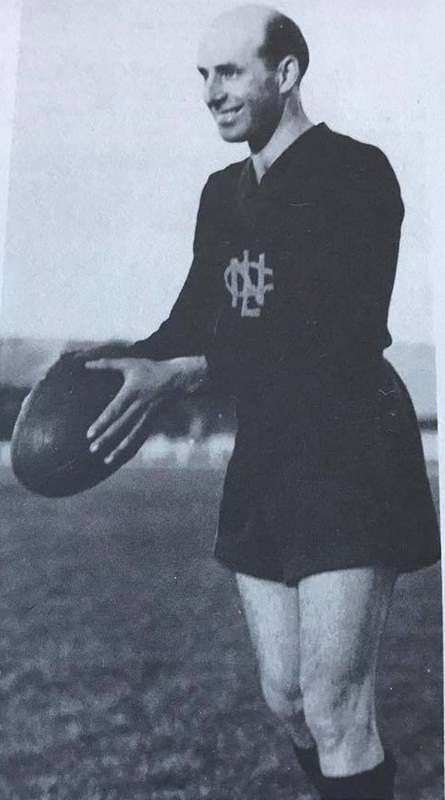 After nine seasons and a club-record 212 senior games, Luttrell departed the club at the end of the 1940 season and moved to the north of the state, playing one season with Longford in 1941 before the association went into war-enforced recess. Upon the NTFA’s resumption in 1945, Luttrell was appointed captain-coach of North Launceston, a club who had not tasted NTFA premiership success since 1931. Under Luttrell’s leadership, the Robins quickly developed into the strongest NTFA combination since the Launceston sides under Leo McAuley a decade before, winning five successive NTFA premierships between 1946 and 1950, while also claiming three state premierships in 1947, 1949 and 1950. Luttrell, who had retired as a player after the 1948 flag, came out of retirement for the last of these triumphs aged 38, playing in both the State preliminary final against Ulverstone as well as the State final proper against New Town a week later, a match in which North Launceston emerged 35-point victors. Luttrell’s methodology as coach was to fully utilise the strengths of the players at his disposal, with particular emphasis on high marking and pace. Luttrell was blessed with a number of great players under his charge during this period, including big men Albert Chilcott and John Leedham and rovers Ray Summers and Noel Atkins. Unfortunately, North Launceston’s period of success couldn’t last forever: after five successive flags the Robins endured a poor season in 1951, winning only six games and missing the finals, and this disappointment led to Luttrell’s departure after 133 games at the helm, Despite this, Luttrell’s overall coaching record at North Launceston yielded a winning percentage of more than 73%, a figure that has him sitting comfortably amongst the best coaches in the history of Tasmanian football over an extended period. After leaving North Launceston, Luttrell stepped away from football for a few years, before returning to coach the NTFA representative team in 1957. Over the following four seasons Luttrell coached the Association side on 11 occasions, tasting defeat in only three of those matches. Post-football, Luttrell remained closely involved with the game for many years. He served as North Launceston FC patron for five years, while he also enjoyed a short stint in the media, serving as The Mercury’s NTFA correspondent for four seasons. Through it all he remained a passionate North Launceston man, and in 1999 he was afforded the ultimate honour by being named as coach of the club’s official ’Greatest Team’.